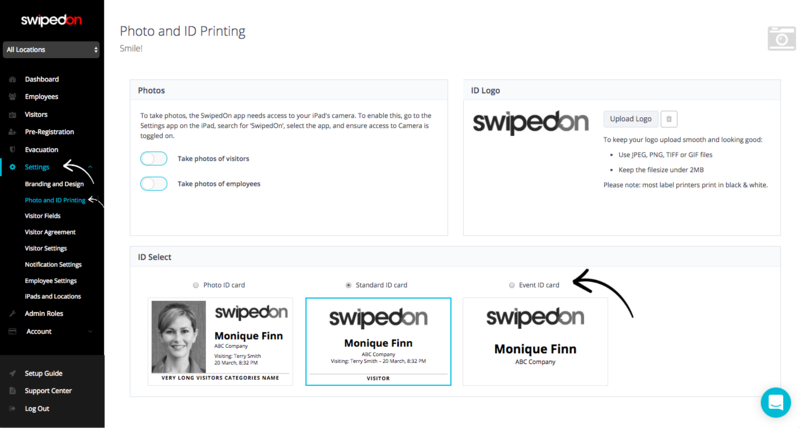 Before printing a visitors badge, you can select from three options, how the badge will display your visitors information. Here you can also upload your company's logo so each badge will appear with your logo, please find more on this below. Navigate to the 'Settings' tab on the left side of the screen. Click on 'Photo and ID Printing'. Below ID Select are three pre-set layout options to select from. How to upload a logo to the ID labels? To the right of the screen is the ID Logo option. Click on the 'Upload Logo' button and select your logo. The logo that is uploaded will appear where the current 'SwipedOn' logo sits. *Please note, if you select the 'Photo ID card option', 'Visitor Photo Capture' will become enabled.